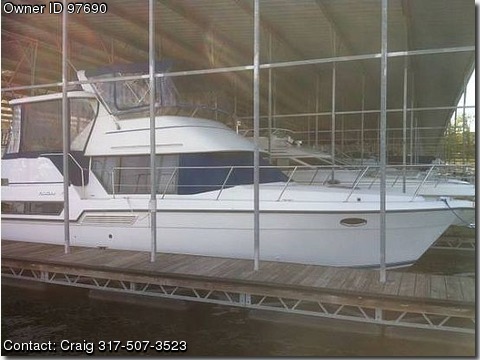 Please contact the owner @ 317-507-3523 or clbnorman@aol.com…Carver 350 Aft Cabin, 1994, 155 hours on engines, original owner, under covered slip at Lake Monroe, In. New bottom paint in June. Two state rooms, two heads, sleeps 7-8 people. Fuel cap. 220 gal., engines- two 454 Crusader gas engines. Salon with chair and full couch (converts to bed), full mini-blinds and drapes, forward stateroom with comforters and pillow shams, teak wood doors and trim, aft cabin with ample storage, over head reading lights,teak walls,cable TV, head with seperate shower. Galley with pressurized hot and cold water, 11 gallon hot water heater, three burner electric stove and oven, dual voltage refrigerator/freezer, microwave, aft deck wet bar with ice maker. Heads include Vacu flush tanks and pumps forward and aft. Two A/C units with 32,000 BTU, two ship to shore radios, Lowrence depth finder, three bilge pumps, hydrolic steering, trim tabs, windless, electronic arch, (3) 12 volt 105 amp deep cell batteries, battery charger, dual 30 amp dockside series, swim platform. Great boat — someone needs to use it.